REGISTER now for the 30th Annual Nonpoint Source Pollution Conference! 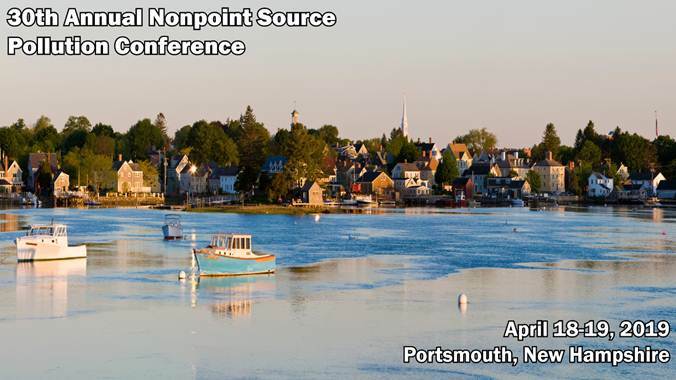 The 30th Annual Nonpoint Source Pollution Conference for the New England states and New York will be held on April 18 & 19, 2019 at the Sheraton Harborside Hotel in Portsmouth, New Hampshire. Both full conference and single day registrations are available. Attendee and Exhibitor Early Bird Registration will close March 15th. All registration will close March 25th. This conference, which is coordinated by New England Interstate Water Pollution Control Commission (NEIWPCC) in partnership with member states and EPA, has become the premier forum for sharing information about nonpoint source pollution (NPS) issues and projects in this region. Conference attendees will include representatives from public and private sectors in New England and New York State involved in NPS pollution management, including participants from state, federal, and municipal governments; the private sector; academia; and watershed organizations. For more information about this conference, and to register, please visit http://neiwpcc.org/NPS30NH.